A perfect gift for UBC faculty, staff, students and alumni alike! Stay dry, while admiring the beautiful view of the UBC Clock Tower and campus. 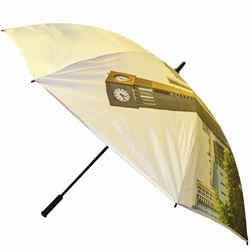 Features full-umbrella print of campus on 62" arc, plus logo inset into comfortable rubber handle. Manual open fiberglass shaft, and Storm Flex ribs and spreaders.